For those with a passion for everything outdoors! A wonderful relaxing Maldives resort stay where there is a fabulous house reef for snorkeling and Sri Lanka tour taking in the gifts of Mother Nature. Seductive beaches and tempting water sports in a Maldives Island, magnificent landscapes featuring lazy lagoons, fertile wetlands, ecologically-wondrous types of forest, imposing mountains, bounteous rivers and waterfalls, an abundance of wildlife - much of it endemic - unique ecosystems, inspiring heritage sites from ancient cities to colonial forts, a vibrant culture including fine arts and crafts and grand festivals, and a people of diverse ethnicity and religious persuasion, charming and hospitable. 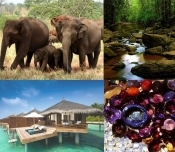 Discover Holidays Sri Lanka invites you to Tour Sri Lanka and Travel Sri Lanka to check out the best Hotels in Sri Lanka you can enjoy your Holiday in Sri Lanka. We have the best Tour Sri Lanka packages online; you can enjoy Tour Sri Lanka and Travel Sri Lanka we provide the best rates for Hotels in Sri Lanka please check our offers and new rates to enjoy your Holiday in Sri Lanka.